Pre-billed as being one of the greatest shows in history (Read – Who’s Next? World Dairy Expo Holstein Show Preview) the 2012 World Dairy Expo Holstein Show was one for the record books. 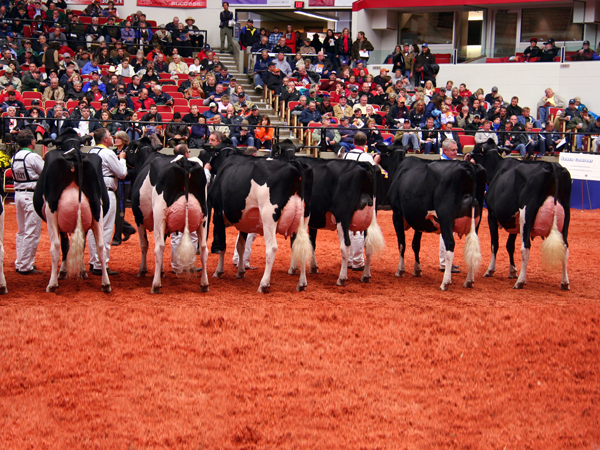 There was the battle of two EX-97 point cows….the Rejoice vs. Monique battle ….. and there was the bull stud battle. First I have to say the judging job that Michael Heath did was outstanding. From his consistent pattern of selection to his extremely lively reasons, Michael did an amazing job. Every set of reasons had some “extra” bit of color. It started with the first class of the day where he noted that the winning heifer, Siemers Gwyn Glam Thisup, was more attractive than a hot woman. It continued through to his Intermediate Champion reasons when he said “I like looking at these cows like I love looking at good looking women”. He did a great job of being both entertaining and informative. More important was the quality of judging Michael did with the support of Associate Judge, David Dyment. 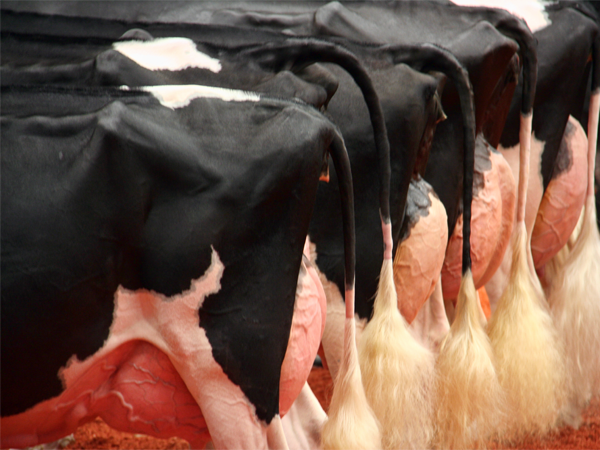 There was a very clear consistent pattern which always included great udders, clean wide front ends and animals that could handle their legs well. All of these were a must have if you wanted to be a class winner. Following closely behind Arrie for Reserve Junior Champion was another Aftershock daughter Jaslyn Aftershock Avila. 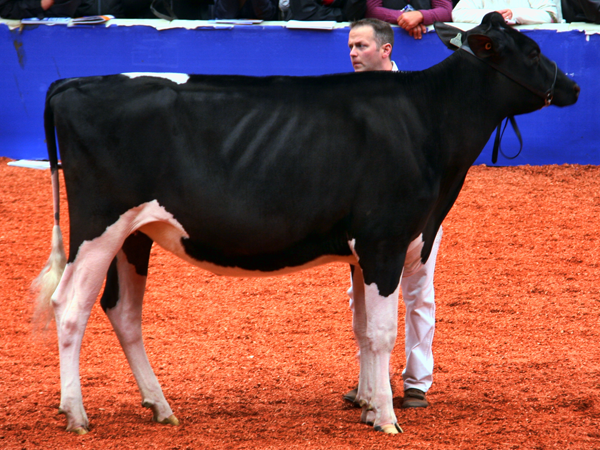 “The winning Junior Yearling from Lookout, Purple-Fever, Halbach & Borba is an extremely long and correct dairy heifer.” One of the things that also became very clear in Judge Heath’s placings was that a heifer had to look good both in line as well on the move. Those heifers that fell apart in line found themselves getting moved down the line. Michael wanted heifers that looked great at all times. Starting the day in the milking classes was R-E-W Happy Go Lucky recently purchased by Buttlerview (Owner of Jet Stream Genetics, and shown by Roger Turner) from VELTHUIS, ARDROSS and SJENDI. Rumours had been flying around about the estimated sale price as well as how great she was. Well Happy Go Lucky didn’t disappoint. This heifer looked amazing and every part the kind of cow that could mature into the future great one. 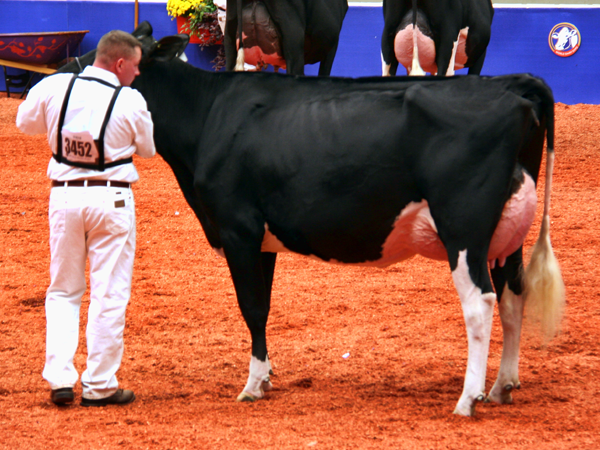 Following closely behind her in the Milking Yearling class, was a Semex Walk of Fame member Brackley Farm Chelios Cherrio owned by Milk Source Genetics and shown by Brian Carscadden. Drawing a lot of attention in the Jr. 2 year old class was the linebred BVK Atwood Arianna (Atwood x Ms Kingstead Chief Adeen (also 2nd dam of Atwood)). I say line-bred because, of course, it is line-breeding when it works and inbreeding when it fails. In the case of Arianna there is no question it worked. She was followed closely by fellow Goldwyn daughter Joleena Gold Pourinrain, and then by two Sanchez daughters, MS Ken-Dren Sanchez Feather and Roquet Jasmine Sanchez. The Sr. 2 year old class was a much-contested battle. 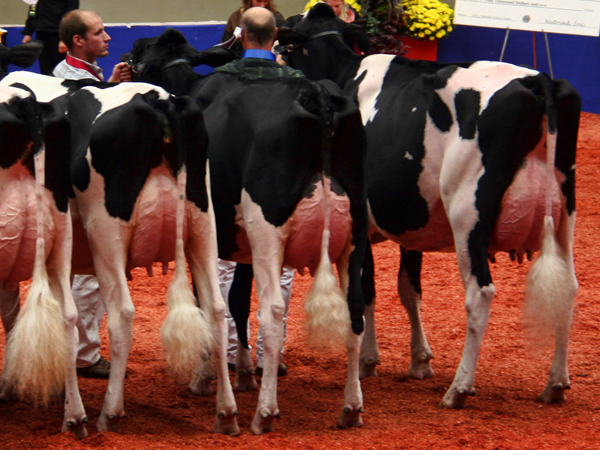 It is interesting to note that both the winner Butz-Butler Gold Barbara and the 2nd place cow, Pappys Goldwyn Rave, are from two very legendary cow families (the Regancrest Brassillia family and the Markwell Durham Raven family). 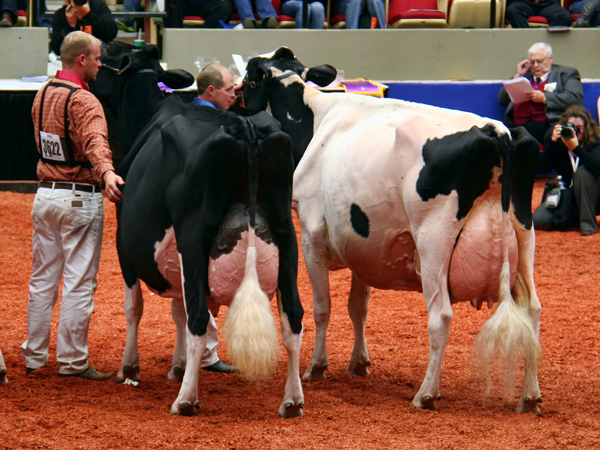 They were followed by Ehrke Ytina Gold Atheina (Best bred and owned) and then Kingsmill Ashylns Annisa, the daughter of another legendary cow – Tri-Day Ashlyn. Immediately catching your attention, when she walked into the ring for the Jr. 3 year old class, was Arethusa Jasper Velour. This big, open ribbed, wide rumped cow is a true eye catcher and on this day was undeniable. This Jasper from a Goldwyn will surely have many show breeders rushing home to breed their Goldwyns to Jasper. Coming in 2nd in the class was Jacobs Goldwyn Valana. This silky black cow edged out fellow Goldwyn Robrook Goldwyn Cameron. It was an extremely deep class. 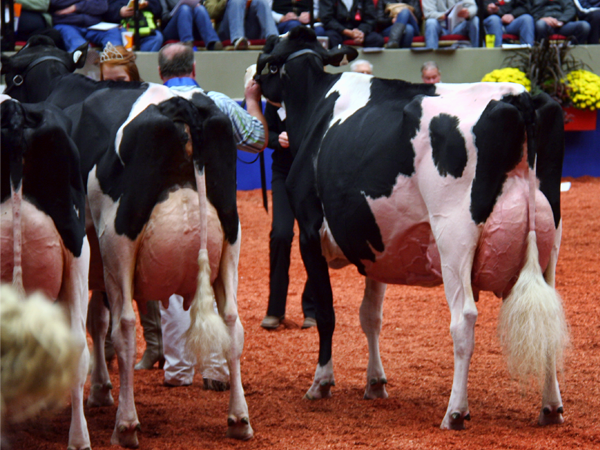 The Sr. 3 year old class was pre-billed to be the great Craigcrest Rubies Gold Rejoice going head to head with International Intrigue sale topper Crookview Goldwyn Monique (Read – International Intrigue: The Secret Is Exposed). The battle never really materialized. While both cows did make it to the ring, Rejoice, just didn’t look the part today. She did not seem comfortable on her legs and never got that “class winning stroll” that we all saw last year and Judge Heath stated that her udder looked “too mature for a senior 3 year old”. She placed sixth. Monique on the other hand, looked every ounce the great cow that everyone who has seen her had talked about. She is an amazing cow as Judge Health said “She has one of the most awesome cages I have ever seen. She has great openness and slope of rib and a great mammary system.” This cow is sure to reach legendary status for all those in attendance. It’s the awesome frame and great udder that also lead to Monique being the Intermediate Champion followed by Butz-Butler Gold Barbara and R-E-W Happy Go Lucky. The three cows made an outstanding lineup with each one cut from the same cloth. They are all big open ribbed, dairy cows with great mammary systems and the cleanliness and mobility that Judge Health demanded. Sticking to his pattern, Judge Health won the 4 year old class with T-Triple-T Gold Prize edging out Jacobs Jasper Abella from Ferme Jacobs. 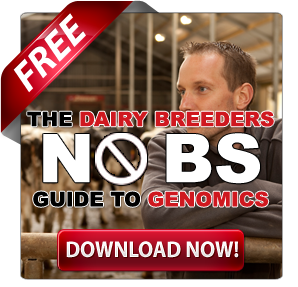 Ferme Jacobs has built quite the following as a result of great marketing tactics such as their World Dairy Expo videos which give breeders great insight into everything it takes to exhibit at such a massive show (Click here to check out the videos). Once more Braedale Goldwyn, the Premier Sire of the show, struck with another class winner. The 5 year old class led off with Wendon Goldwyn Allie. Allie was followed by another Goldwyn, Scientific Gold Dana Rae. Like the senior 2 year old class winners, Allie is also from a very famous type cow family Scientific Debutante Rae, tracing back to the Queen of the Breed, Glenridge Citation Roxy. As the 6 year & older old class entered the ring, a hush come over the crowd. Here was the much anticipated battle between RF Goldwyn Hailey and Harvue Roy Frosty. 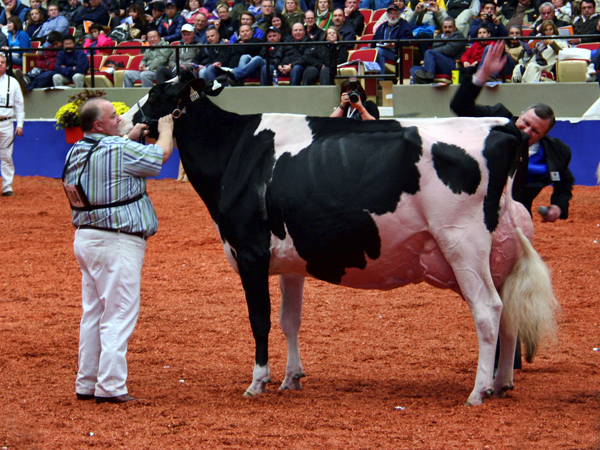 Hailey dominated the 2012 Expo Quebec (Read – The Story Behind How Two Full Sisters Dominated Expo Quebec) after spending 2011 in the shadow of World Dairy Expo 2011’s Supreme Champion, Eastside Lewisdale Goldwyn Missy. Now she was up against the 2010 and 2009 World Dairy Expo Supreme Champion, the great Frosty. In pre-scouting the show, I went to see how both Hailey and Frosty were settling in. Hailey looked fantastic. While checking out the string from Ducketts, I and my parents were asked to leave “their barn”. 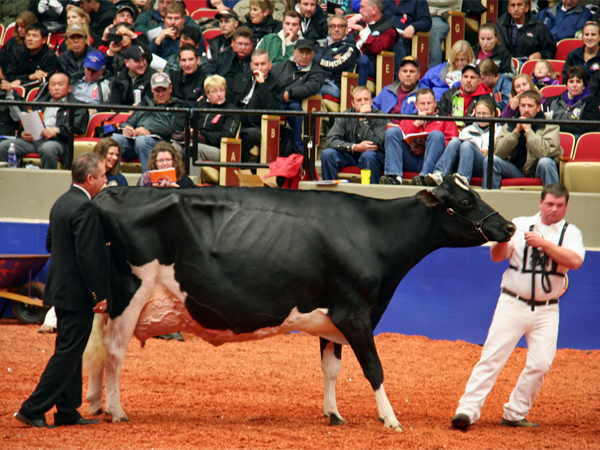 Apparently they did not appreciate comments made in the Bullvine saying that, for Lot 2 of the 2012 World Classic, “FUSTEAD GOLDWYN GUTHRIE would supply the “mobility” that Frosty needed (Read more –The Investors Guide to World Dairy Expo). Obviously the comment was supported by others as Frosty’s heifer sold for $17,500; just over half what Hailey’s daughter sold for (read World Classic Highlights). As for Frosty, things did not move on so smoothly. When she entered the show ring, she just didn’t want to demonstrate that usual “stroll” that she has become famous for. Instead of commanding everyone’s attention for good reasons, she caught everyone eye for the wrong reasons. Frosty just wasn’t at her best and battled showman Michael Duckett the whole way, and ended up 6th in this great class. We understand that for Duckett`s the success of both Frosty and Craigcrest Rubies Gold Rejoice bring out very strong emotions, especially when under such pressure to perform. Over the years I have learned the hard way, how you conduct yourself in these critical moments will guide your future success. At the end of the day, many asked why Frosty had entered the ring? My response is how could the owners have known that she would simply refuse to lead and not stroll as she has so many times in the past? While her fore udder did not blend as smoothly to her massive frame as it had in the past, the real issue was that she did not lead well hence highlighting her mobility issues. Unless she had been a challenge walking to the ring, it would have been really hard to predict what happened. As I watched Mike and Frosty struggle, instead of feeling good about the karma that been bestowed upon them, I actually felt pain for Michael, and I am sure all those back in the barn who had put so much effort into getting her to the ring. With Frosty out of the picture, the class was Hailey’s for the taking and man did she take it. As Judge Heath put it “This cow just loves to show”. Continuing where she left off last year, Hailey looked amazing. Many wondered, “If Missy had been back, could she have beat Hailey?” While it’s great to speculate, there is no question that on this day Hailey was not going to be defeated. She simply looked that good. Her extreme balance and correctness will have her generating her own legendary status. 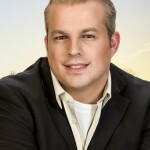 I have had the opportunity to know Adam Hoddgins for many years. Over the years I have gained a great respect for Adam, both for his ability to spot and manage great cattle as well as the fact that he is a really nice guy to talk to. That is why, when Starbrite Lyster Lindsay, won the 125,000 lbs. Class I let out my loudest cheer of the day. Not because I thought she was going on to be Grand, or because I thought it was a close battle between her and 2nd place, Savage-Leigh Leona, but more because I love to see good things happen to good people. At this point, with all the big battles over, it almost seemed like a formality for Hailey to be named Grand, followed by Monique and the 2nd place aged cow, the amazing uddered, Boulet Goldwyn Chalou . 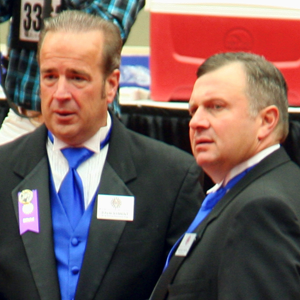 Yet, continuing with his great style, Judge Heath entertained and endeared himself to the spectators who will long remember the 2012 World Dairy Expo and the 394 animals as one of the greatest cow shows in history. so..nothing to say about Licorice? Correction in the Jr. 2. Adeen is actually the 3rd dam of Atwood. Pappy’s farm out of respect for Duckett’s is why I have not disclosed the full details of what occurred. Your attacking my credibility is forcing me to comment on a subject that does no one any good to have debated further. Please notice by the comments below posted well before yours that comments have been open all along. I understand your defending you friends, but understand I am defending my parents right to not be physically abused when previewing the cattle. If they had not tried to phaycially force my parents out of the barn I would not have had such an issue. Actually I find it very interesting that you would support the physical behaviour. 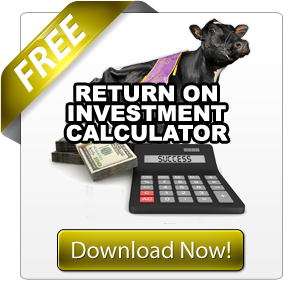 I would also check you facts, I have always endorsed breeders getting credit for breeding great cattle. I respect those who earn respect. Errors in judgement or actions don’t earn my respect. 2 Parts to that answer. When have we written about Markwell Durham Raven? What have written about Markwel Durham Daisy but that is it. 2nd part. I was leaving the physical nature out, because I didn’t want to put that heat on Duckett’s you forced me to disclose. Your who deserves the credit article was the one that gave the impression that Durham Raven was one of the cows you were refering to (I know you didnt mention her name). I hope in the future your opinions are on the lighter side when you have to potential to de-value a persons livlihood. I know its your right to say what you want. 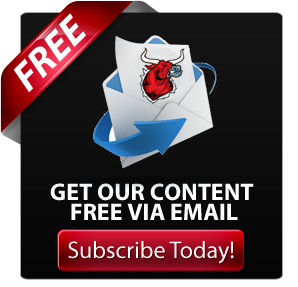 What if the shoe were on the other foot and it was your cow someone was makeing negative comments about. Would you be upset? I have tried to make some logical points that you have refused to look at. You win! 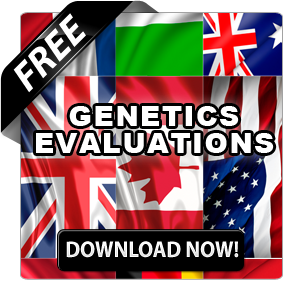 Im sorry it was the Mark of a true breeder article in which I was refering to in my last comment. I totally understand your comments about the Mark of a True Breeder (http://www.thebullvine.com/the-bullvine/mark-true-breeder/). What I was trying to say there, and sorry if it did not come across correctly. Is that far to often people give ALL the credit to the prefix on the animal, as opposed to looking into the bloodline behind the animal. It takes all aspects to breed a great one.